A plain white label encases this small bottle of HemMed. 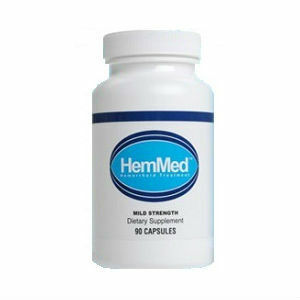 Claiming 5-7 day results, the triple action therapy hemorrhoid management program is said to rapidly shrink hemorrhoid tissue and soothe and reduce inflammation. Setting aside this big time promise for a moment, let’s shed some light on this name. Do you think the creators of this pill thought the name through? If you try and Google HemMed, you will find hemmed, feeding you pages of content that has nothing to do with hemorrhoids. This can easily become confusing when you try and do your own research on the product. There is virtually no websites that can give any additional information on this product. Essentially, they are lacking internet awareness. Does this have anything to do with their confusing moniker or is there simply no customer interaction besides the testimonials that exist on their website? *Witch hazel and horse chestnut leaf, two of the main ingredients, each come with a risk of vomiting and upset stomach. *You should not take diosmin for more than three months without medical supervision. *Some people experience an allergic response to blond psyllium. If you have diabetes, then you will need to check your blood sugar level regularly while taking this medication. Horse chestnut is known to lower blood sugar levels, and so it must not be taken with certain diabetic medications. Anyone with allergies to latex should not take supplements containing this herb without first consulting a physician. There are different treatment options, but the cheapest seems to be the one week treatment that is priced at $39.95. Each bottle contains 90 capsules. Although the promise is to heal hemorrhoids in 5-7 days, the website recommends a two week treatment which boosts the price to $59.95. Hmm, so much for the quick turnaround. It appears as if you’ll need to take the same dosage as many other hemorrhoid pills, making this product less result-driven than we first thought. A 60 day no-risk guarantee is offered for this product. While this guarantee is a smaller window that competing brands, if their claim is all they say it is, the 60-days is a generous offer. As with any product without consumer feedback, you can rely only on the word of the seller. Considering we’re deadlocked in results, there is nowhere to turn for definitive results. You can bite the bullet and do a trial run, but you had better make certain you fit within those 60 days if the hype doesn’t live up to reality and you want a full refund. The varying side effects of this blend of ingredients are also a determining factor. Which is the lesser of the two evils? Do you want to gamble your risks of being one of the unfortunate who experiences these side effects? Unfortunately the lack of reviews says it all. Without knowing how many people saw positive results, it makes the question of purchasing a tough one. Combine that with the lack of information on the product and you have quite a puzzler on your hands. John Parker	reviewed HemMed	on September 3rd	 and gave it a rating of 2.